BRYAN STARCHMAN (left photo) BRYAN STARCHMAN grew up in the small foothill town of Mariposa, CA., just outside of Yosemite National Park. He began writing short stories in the first grade and fell in love with screenwriting in high school. Soon he tried his hand at playwriting. At UCLA, he spent four years honing his craft. There, he won the UCLA playwriting award for his satire on fraternity life. Unfortunately Bryan and Los Angeles went together like Elizabeth Taylor and husbands -- it just wasn’t meant to be. Now he lives in Mariposa with his beautiful wife Noel (even a geek sometimes gets the girl!) and his cats, Wily and Pinkerton. He teaches American Literature, Advanced Placement Language, and Theatre at his old high school. His plays have been produced over 1300 times in all 50 states and Puerto Rico, 9 out of 10 Canadian Provinces (come on Prince Edward Island! )and six more countries including Mexico, England, Italy, Dubai of the United Arab Emirates, South Africa, and Portugal. He has also collaborated with fellow Eldridge playwright and composer Stephen Murray to create "Just Another High School Musical." 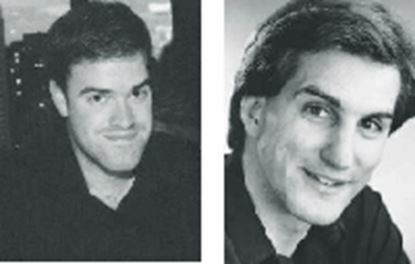 More information at www.bryanstarchman.com STEPHEN MURRAY (right photo) is a composer, lyricist and playwright who has been a Performing Arts Educator since 1985. Steve's plays and musicals have been produced throughout the United States as well as in Canada, Germany, South Africa, Singapore, Japan, and China. Some of his award-winning titles can be found in the Eldridge catalog. "Musical! The Bard is Back!" was the 2000 winner of the Columbia Entertainment Company National Playwriting Contest, the first musical ever to win the award. Two other Eldridge titles have also been recognized by the CEC Contest, "Mother Goose, Inc." and "The Universe and Other Stuff." Steve was bitten by the theatre bug at an early age. His parents were and still are very active in community theatre. Steve took the family hobby onward as a performer, writer, director, and parent. The Murray children are now getting into the act. Son Ben is a professional actor, daughter Jennifer has performed in and directed several productions, and younger children Daniel and Natasha are in perpetual rehearsal for their stage debuts. Steve met his wife, Ruth, in a play rehearsal.